Reading prospects Ricardo Pinto (World roster) and Dylan Cozens (USA Roster) will represent the Phillies in the Futures Game in SanDiego All Star week. Former Phillie, Jim Thome, is the hitting coach for Team USA. The Phillies’ #1 pick, Mickey Moniak, is expected to make his pro debut in the GCL Phillies’ game in Tampa Wednesday. The Phillies 2015 #1 pick, “C” Randolph, is also expected to play. Randolph has been on the DL since suffering a shoulder injury in April. Come out and see the most expensive outfield in the organization – LF Randolph ($3.2M, CF Moniak ($6.1M), RF Jhailyn Ortiz ($4.2 M). The Phillies five outfielders make a combined figure slightly under $4.1M. Lehigh Valley (45-34) Lost to Columbus, 1-0. James Russell (2-4, 4.28) went 7.0 innings and gave up an unearned run on 5 hits, but still took the loss with a game score of 72. The IronPigs only managed 4 hits. #1 Crawford (.219) went 0-2 with a sac and BB. #9 Knapp (.262) went 0-4. #23 Sweeney (.228) went 1-3 with a double. #30 Lively (3-1, 3.11) – DNP. Reading (55-23) Beat Erie, 7-2. Tom Eshelman was lifted after allowing only 5 hits in 5.0 innings. Angelo Mora (.271) gave Jesse Valentin the night off and went 2-5 leading off. Jake Fox (.265) also had 2 hits. Rhys Hoskins went 4-4. Fox and Jorge Alfaro hit home runs. Fox’ HR was his 14th, his 3 RBI give him 46. Osmel Aguila threw out a runner at home, Aguila to Serna to Alfaro. #6 Alfaro (.303) went 1-4 with a HR (9) and RBI (42). #15 Eshelman (1-0, 1.80) – 5.0 IP, 5 H, 0 R, 0 ER, 0 BB, 2 BB, 73 pitches/54 strikes. #19 Hoskins (.289) went 4-4 with a double. #22 Cozens (.273) went 1-4 with a double. #27 Brown (.234) went 0-3 with a BB. Clearwater (43-31) Lost to Daytona, 1-0. John Richy pitched into the 7th inning for the first time this year. He allowed 3 runs (3 ER) on 7 hits, 1 BB, and a HR. He threw 80 pitches, 54 strikes. Matt Hockenberry struck out 3 in 1.2 innings. Jesen Therrien pitched a one-hit ninth in his first appearance since returning from rehab. 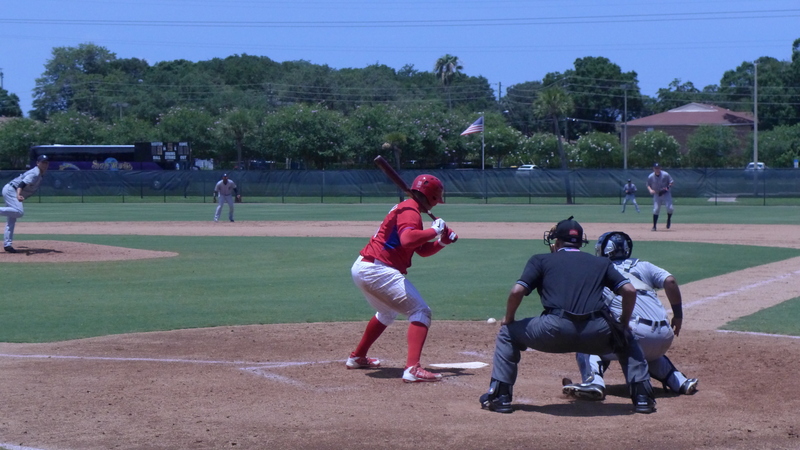 Scott Kingery had 3 of the Threshers’ four hits – one was an infield single, the other two were nice line drives over short into left field. #11 Kingery (.286) went 3-3 with a HBP and SB (20). #12 Canelo (.239) went 1-4. #14 Tocci (.283) went 0-3 with a HBP. Kingery would have had a second stolen base but for a balk call. He was picked off first, but had such a good jump that he had the base stolen when the balk was called. Lakewood (33-42) Beat Hagerstown, 12-5. Alberto Tirado had a ragged start. He had base runners in every inning and faced 5 batters in the fourth inning without recording an out. He was plagued by 2 stolen bases, but assisted by a caught stealing and a runner thrown out at home by Zach Coppola. Edgar Garcia (2-0, 1.35) and Jacob Waguespack (3.40) held the Suns to 1 run over the next 5.0 innings. Robert Tasin (4.93) gave up 2 runs in the ninth while striking out 2 batters. The BlueClaws unleashed a 17-hit attack (15 singles and 2 doubles). Coppola (.370) had 4 hits. Deivi Grullon and Carlos Duran (.259) had 3 hits each. Josh Tobias (.300) and Damek Tomscha (.298) had 2 hits apiece. Tobias (47) had 3 RBI. #5 Randolph – DL, shoulder, rehabbing at Complex in Clearwater. #20 Tirado – 3.0 IP, 4 H, 2 R, 2 ER, 4 BB, 3 K, 1 HR, 64 strikes/31 balls. #29 Grullon (.250) went 3-6 with an RBI (23) and PB (11). GCL Phillies (2-1) Lost to the GCL Tigers West, 6-2. Will Stewart pitched a nice game Tuesday. He tossed 5.0 shutout innings. He allowed 2 hits, 2 walks, and struck out four. One of the hits was a soft ground ball to short that probably should have been an out. The other hit was a line drive single. It was the only hard hit ball Stewart gave up. Will Stewart winds up early in the game. Kale Fultz, Jordan Kurokawa, and Ismael Cabrera all pitched 1.0 solid innings in relief. The problem here was that Cabrera came out for a second inning. He had retired the Tigers in order in the eighth including an inning-ending strike out looking. The first batter in the ninth topped a ball in front of the plate. Catcher Lenin Rodriguez missed an unnecessary bare hand grab and the Tigers bench came alive on the 4-foot single. Cabrera got a fly ball to center that could have been the fourth out instead of the second out of the inning. Cabrera hit the next batter and was finally removed from the game. Recently demoted Randy Alcantara gave up a run scoring double on his first pitch, and a 2-run double on his second pitch. A SB, E2T, and WP brought home another run. After a walk, a pop up finally ended the inning. Until the ninth inning, the Tigers had been held to 3 hits and 2 walks. Rookie ball. SMH. The Phillies took a 2-0 lead into the ninth, in spite of their anemic offense. Malvin Matos had 3 of their 6 hits. He launched a solo home run over the left field fence for their first hit with two outs in the fourth. He laced line drive singles to center and left in two later at bats. I thought Jhailyn Ortiz had driven home a run on a bad hop double over the third baseman in the seventh. When I checked the official score, I saw that it was ruled a two-base error. Jhailyn Ortiz lays off a pitch. (Note: Ortiz is the only player wearing a long-sleeve shirt under his jersey. On the play prior to Ortiz’ at bat, Danny Zardon ground a ball up the middle with Matos on first. The shortstop made a nice diving stop and flipped to second to start the double play. But, the second baseman hadn’t reached the bag and he conceded the base to Matos and relayed to first. I saw the unusual 6-4-3 to record a single out at first for the second time in a week. The Phillies Evan Rogers, Daniel Brito, and Edwin Rodriguez pulled off the same play last week. #25 Jhailyn Ortiz went 0-4. DSL Phillies (7-14) Lost to the DSL Athletics, 3-2. Twelve combined steal attempts. The A’s went 4 for 7, the Phillies went 3 for 5. Dixon Gutierrez (.372) went 2-4. Keudy Bocio (.258) went 2-4 with a BB. 6/27 – Philadelphia Phillies signed RHP Andrew Brown. 6/28 – RHP Andrew Brown assigned to GCL Phillies. 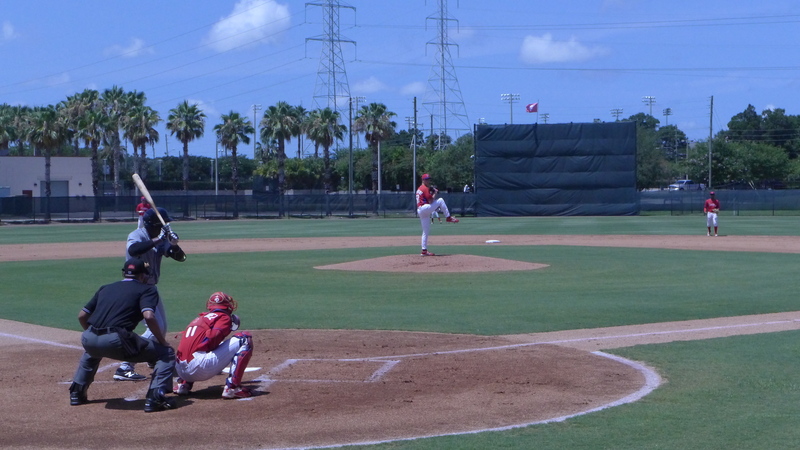 6/28 – RHP Justin Miller assigned to GCL Phillies. 6/28 – Luis Espiritu, Jr. assigned to Lakewood from Williamsport. 6/28 – Lakewood placed 3B Jan Hernandez on the 7-day disabled list retroactive to June 26, 2016. Wrist injury. 6/28 – LHP Mario Hollands assigned to Reading from Lehigh Valley. 6/28 – Reading activated C Joel Fisher from the 7-day disabled list. 6/28 – Reading placed LHP Tom Windle on the 7-day DL. Sprained right ankle. $190,160 remains available for over slot payments until we learn any over slot bonuses to prospects like Andrew Brown, et al). https://twitter.com/jimcallisMLB/status/747926535936565248?lang=en 125 k for Kyle young I hope this link works. I thought Jim need the bonus money number . No, I think that was Hinkie yesterday trying to determine if Hillhouse and Morris could still be signed if there was enough surplus bonus money available. Read extra ings above . Yes….what about it?…he said he signed ..that’s it. Now go to my post and click it tells you the rest about Youngs bonus. Never mind it’s all good Jim posted young bonus. They can go 5% over I think it is without penalty. Kyle Young is the 6’10” lefty from NY. This is gonna be fun. JP Crawford has 1 K and 3 BBs in his last 7 games. Before that he had 23 Ks in his previous 28 games in LHV. He’s raised his BA by 19 points over that stretch. He’s settled in nicely. He’s made adjustments. Next adjustment to be made will be in the Major Leagues. Probably not this year or at least not before September. The righthanded hitting Hoskins has interesting splits. Against lefties, he’s hitting .270/.347/.683/1.030. Against righties, .295/.357/.531/.889. He hits for a little better average against lefties, OBP is very equivalent but he has more power against lefties. That’s nice to see. He’s got some hitting tools. He’s cutting down on Ks recently but when they come they occur in bunches. 2 games in his last 10, he;s had 3 Ks. As long as Stassi and Ruf are in LHV, he’s staying in Reading. If Howard were to trip over a chalk line and be put on the DL, someone would get the call the Majors and Hoskins could move up too. Eshelman had a smooth outing. He only threw 73 pitches so it look like they are limiting his innings. So far this year he’s thrown 69 innings. His previous high in any season since college is 10. Don’t want to tax that arm too much. It’s still June. Richy’s outing was fine. When you’re team left the bats at home (except Kingery), you aren’t going to be too successful. He’s an inning eater and if he could miss a few more bats, he’d be extremely successful — as long as the the other guys bring the bats. Coppola’s been back from injury for 11 games. He’s keeping his average @ .370. He’s a singles guy with speed who doesn’t K much but will take a BB. A prototypical leadoff hitter who should be moved up in the next couple of days or weeks. I can see the Phils giving him 20 to 30 more games at LKW before the call up. Anyone notice Grullon is hitting .260? In his last 10 games he’s hitting .366. The 20 y/o has HR power. He was supposed to be known for defense but he has 11 PBs and 5 Es behind the plate. Maybe the Phils could hire Chooch, after the season, to be the roving catcher instructor. I’ll bet Grullon would take to him very well. bellman…..’Against lefties, he’s hitting .270/.347/.683/1.030. Against righties, .295/.357/.531/.889. He hits for a little better average against lefties’….do you mean righties vs lefties? Sorry, late night and early morning. I don’t think Ruf and Stassi are blocking Hoskins – if, in fact, they are, there is something wrong with the decision-making in the organization. At most, perhaps they are slightly delaying him. Hoskins very well could be the first baseman of the future, so when he’s truly ready, he should be promoted. I doubt he finishes July in AA. I didn’t say nor mean to infer that Stassi or Ruf are blocking Hoskins. I’m assuming in the “near” future that Howard will get a hangnail or tweak something and another 1st baseman will be called up. I think it should be Stassi but one of them will be called up. Hoskins is not ready for the big leagues yet. He can use a lot more seasoning in AA before he even sees AAA. He’s just starting to cut down on Ks. He’s got the power but he needs to get more selective against the better pitchers. AAA will be a whole ‘nother ball game and different adjustments. He’ll benefit from another month in AA but if crap happens and Stassi or Ruf are recalled, then he could start his adjustment process a little early. Stassi and Ruf aren’t blocking, they have to be ready to move to the big leagues… just in case. I thought I read Hillhouse gave the Phillies a number that he’d sign for . Trey Morris is exactly rated higher by BA then Klye Young is , Jackson Klein been quiet , I think that’s it great pull by Alvarez and company . They needed the pitching help Joe Jordan will know to do . After signing Kyle Young for $225k ($125k against bonus pool), the Phillies’ available bonus pool is down in $190,160. That number does not include Andrew Brown, as we don’t know what his signing bonus was. Hopefully the Phillies at least one more high school draftee, but their bonus pool is almost maxed out. And just to clarify, have Jackson Klein (round 33) and James Ziemba (round 37) signed? No, but Alexander Kline has. Re:Richy – the missing bats observation is key. In my haste to post, I left out the pitching breakdown. He only missed 2 bats all night, both on third strikes. Better control is also a must. He only ran two, 3-ball counts but they resulted in a HR (off an 80 mph off speed pitch) and his only walk. He pitched behind too much. He only threw 13 first pitch strikes to 26 batters (50%). His FB was 88-91, t92 mph. I think there was a rain delay in 5th for EEshelmt. Not positive. Yes, Matos was the lone bright spot for the offense. He barreled up on all three of his hits. Coppola is killing it, I can see him moving up when C gets reactivated. How come Alfaro isn’t in Futures Game? That GCL OF will be quite expensive. Nice job by Phils to get HS pitcher signed. We should learn about international signings in the next few days. Definitely intrigued by Coppola but he needs to get bumped a level (along with Tobias) before we can get any sort of read on him. 2nd year pros with 3 years of college who are ripping up the SAL are not outliers. Future lead off. Tons of instincs. Congrats to Cozens and Pinto. All I ask is that Hoskins, cozens and Alfaro do not get blocked by much inferior prospects in AAA such as Ruf, Knapp etc. maybe move up after all star break if they keep this up? Player A and Player B both 23 year old catchers at Reading in their prospective years. What makes either player inferior to the other???? If you can’t guess Player A is Alfaro and Player B is Knapp. I’m not saying one is better than the other but they put up similar numbers in the same situation, what is to say that Alfaro won’t put up similar numbers to Knapp if promoted to LHV. I’m not saying either player is better than the other, but the situation as it is right now is playing nicely to both players’ development. If there is a chance to promote both of them do it, but don’t sacrifice playing time of one for the other. Alfaro has a better power tool, has shown he can hit for decent avg and has shown more ability to play the catcher position. His k/bb splits need to improve but I don’t think many will argue his ceiling is higher than knapp. Knapp would not even play over rupp IMO in the bigs. Alfaro won’t stick in the majors with the k/bb ratio he has right now. Once you see Alfaro throw, you know who the better prospect is. His arm is an amazing tool. Ok, I’ll be the one to say it since no one else has. I like Ricardo Pinto and all but I’m shocked he’s been selected for the Futures Game after the year he has had. It has been very up and down, and he did not have a huge prospect profile nationally before this season. I’m going to assume that his selection is in someone related to a n umbers crunch on qualified “World” pitchers currently in the minors. Don’t get me wrong, he’s a good prospect with a likely major league future, and hey its great for him, but his season doesn’t exactly scream for being recognized in the Futures Game. I’m also shocked. But based on the Luis Perdomo and Yohan Flanders, that have made it in the past, I shouldn’t be surprised. Was at the Reading game last night. Eshelman was lifted after 5 innings after a significant rain delay. He pitched well but gave up some hard hits and hard hit outs. He is a strike thrower but got a bit too much plate in some instances last night. Still didnt give up any runs which is a testament to him. Solid outing. It’s fun watching the big 3 in the middle. The second time through the order it went home run (Alfaro) double (Cozens) single (Hoskins). Then Fox crushed a 3r HR. Ortiz could be going through something similar to what Adrian Rondon of the Rays went through last season as his first taste of full season pro ball. Understand…..a little PM thought matter, for if it should occur, others with high pedigree have experienced the same as 16/17-year olds.and patience is the order of the day. Do not know why that is thought of being a quick statement…..more of a possible premonition or outcome. Na cut ‘ em only 4 mil can’t wait getting too old . Great movie reference… Problem Child… Starring the late great John Ritter… Always love your pop-culture gems, Marco! Does that seem like someone who needs an attitude adjustment? Can someone explain to me why Cole Irvin being a college senior was able to get such a high bonus. I thought seniors have so little leverage they usually sign for under slot. Is he just that good even though he’s coming off of TJ surgery. He’s a redshirt Junior. He has eligibility left, just like any other junior. He was also throwing a 95,96 fb at the end of the yr . The Phillies stocked up on lefty pitching I guess they wanted him. They still signed almost 80% of there class. its a shame Hoskins is not in the Futures game, look at the player they picked to play 1st, no comparison to Hoskins’ numbers. MLB analyst Jon Mayo and Jim Callis and their staff may have a little input in the Future Stars selection. Hoskins was ranked 19th in the Phillies system prior to the season. If only for a brief 2 to 3 week window before promotions and rosters are changed post trade deadline, I’d love to see these guys together at Lehigh – Crawford, Williams, Cozens, Hoskins, and Alfaro. ….although Reading fans might not appreciate the tear down. Mickey Moniak did not get a hit in his first at bat. I don’t want to jump to any conclusions, but I can draw no other conclusion from this experience than that he is an awful baseball player. I think he’s a total bust and I’m afraid we are going to have to release him and “move on.” What a wasted pick! Another at bat and another strikeout for Mickey. This is an unmitigated disaster. Dam they throw a 25 yrs old at the kid in his first at bat. rocco……good experience for the kid. At the moment that I am writing this, Moniak has a single and a walk and now has an OBP of .400. So, why don’t we just bring him up to the Phillies and lead him off? Like I was saying, this was a great draft pick. They to get him up to Clearwater to end the year and by next September, he needs to be in Philly. I just spit water all over my keyboard. Ok, not really, but well done. hahahaha. Do you think they could try an move him to pitcher? What’s the velocity on his fastball? And another thing, why are they “babying” him? They are paying him like a man, so he needs to hit a like a man and start doing it NOW. I say send him up to Reading and if he doesn’t hit by the end of the summer, DUMP HIM! Of the posts that annoy me, the “babying” posts make me most crazy – as if these players are being coddled and that pushing them past their natural physical limits will make them improve. And, while I’m at it, when did “baby” become a verb? WTF! Wasted pick? You, sir, are misinformed. Can you really not tell that I was joking? This is perhaps the best prognosis we could get. I was worried about labrum and rotator cuff issues. Not only is it probably the best prognosis, it is a bit comforting to know there is a reason for his decline in performance and (hopefully) a fix for it. Fingers crossed. Randolph played in the GCL today. He had 2 ABs one of them being a BB. He was replaced in the 4th. Hopefully, just to get him some game time and not because he reinjured something. What happened to TJ surgery bone spurs the new in thing ? See Tyler Kent after 2 starts in LF and 3 for 9 for Williamsport has retired, 22 years old. He was picked in the 26 round. There’s something pretty big going down right in milb it could mean no more ss or GCl league teams. K LAW , JJ Cooper , Eric LongenHagen are all tweeting about it. They just will go ninety miles and play in cuba. Here it is https://twitter.com/jnorris427/status/748190954020954117 a game changer. You would think Congressional members would have bigger fish to fry…say terrorism. Lobbist rule the Government now get a few hundred for your cause.pretty soon Mlb will College for there minor league. Well I can tell you that Matt Wink will be 100% behind this . . . he blocked me on twitter bc i questioned what a fair wage is for a minor league baseball player. Why did Pivetta make the quick exit? Matz will have to have surgery after the season and may not be ready for the beginning of the season and they need him more now then the beginning of next season. Reading 14 hits and 14 runs with 4 HR’s, what a team.